Efficient, budget-conscious organizations know that you can never stop searching for opportunities to streamline. That's why infrastructure reduction has become such an important step in the ongoing, cross-sector quest to keep overhead low, trim unnecessary fat and remain cost-effective, competitive and agile. And many organizations have found that one of the fastest and most effective routes to infrastructure optimization lies in consolidating print servers. How exactly is print server consolidation beneficial? Aside from the obvious hardware eliminations through basic print server removal, consolidating print servers means less time and energy—and consequently money—spent on maintaining, operating and upgrading your organization's print servers. In theory, it also means less downtime. Instead of having multiple points of failure that can crash or go offline, thereby forcing printing to stop until techs can troubleshoot and fix the cause, resources can instead be directed to making the remaining print servers redundant. With that gain in uptime, employees can be more productive. But in real-world scenarios, consolidating print servers can have unanticipated drawbacks. To illustrate, let's say that you have three locations—a primary site and two remote sites—with as many print servers. As part of your infrastructure reduction initiative, you remove the two print servers at the remote sites and consolidate your printing infrastructure using the central print server at the primary site. So you've now accomplished your main task, but you've also exposed these three locations to a single point of failure. When the central server crashes, hangs or fails, you now have three separate sites without printing capabilities until the issue can be resolved. Furthermore, by consolidating print servers, the central server now has to function under increased printing load. That makes it even more susceptible to the driver conflicts and stuck queues that regularly knock printer servers offline. Unfortunately, as mentioned above, you'll have to invest in redundancy measures to avoid this. That means you'll actually have to purchase one or more warm standby printer servers to supplement your central server, which counters any gains you might have achieved through print server removal. Each of these standby print servers also has to be actively maintained and updated. Therefore, at the end of all this, the act of consolidating print servers will have consumed extra time and resources without realizing any actual long-term benefit. For effective infrastructure reduction, it makes far more sense to choose print server elimination over merely consolidating print servers. By completely eliminating print servers from your print environment, you don't just remove their hardware, you remove their inherent weaknesses and attendant costs. PrinterLogic doesn't just make print server elimination possible – it also makes it hugely advantageous. Our print management solution goes beyond print server removal to provide you with powerful centralized administration, a self-service installation portal that empowers your end users, plus effortless printer and driver management. A single server running PrinterLogic software can scale up to accommodate tens of thousands of printers, yet it remains robust to driver conflicts and doesn't entail a corresponding increase in management complexity. An independent survey (TVID: 61C-B50-F4D) revealed that 74% of organizations were able to shrink their infrastructure by 30% or more using our solution. If your organization is thinking about consolidating print servers, remember that consolidation doesn't necessarily lead to optimization. 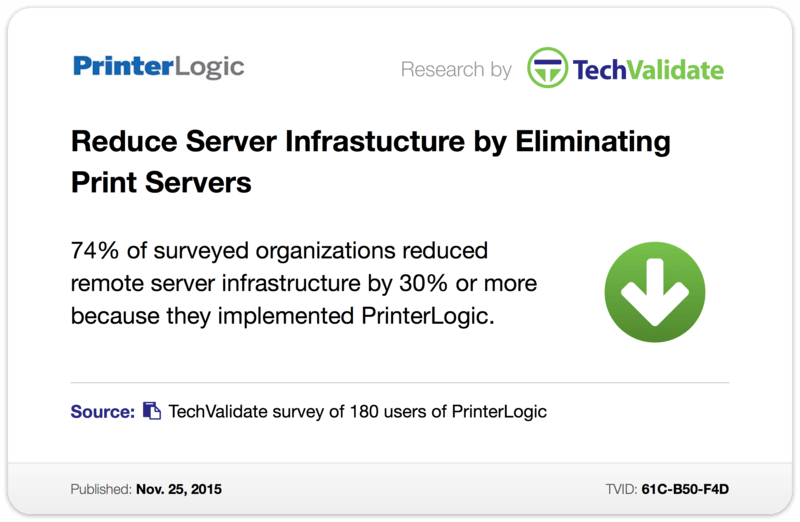 Eliminating print servers completely with PrinterLogic does.